This privacy notice explains how Dunstable Town Council looks after personal information you give us or that we learn by having you registered and the choices you give us about marketing you want us to send you. We collect information about you when you when you order a product or service, book an event, complete a survey, use our website whether contact is online, on paper, by email or over the phone. The information you give us may include your name, address, email address, phone number, payment and transaction information, qualifications, insurance details or photographs and IP address. We will use your personal information to deliver and communicate with you any of the services we offer, to deliver products you have ordered and to promote further Dunstable Town Council activities. We will therefore pass your contact details onto our approved mailing house, for distribution of our newsletter and email communications. 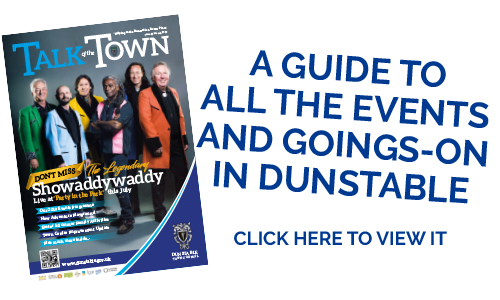 When you book a place on a Dunstable Town Council event, we will use your information to process your payment and assist you with attending the event. We will contact you via this information to arrange your tickets and supply further event details. If you have consented to receiving marketing, you may opt out at any time. We will keep your information to contact you for a maximum of 2 years, after which your information will be deleted (apart from records of financial transactions which will be retained for 6 years as required by HMRC). If you have given consent for us to contact you, we will maintain contact until you opt out of communications. Your information is stored within the EEA on secure servers. Any payment transactions are encrypted using SSL technology. Sending information via the internet is not completely secure. Although we will do our best to protect your information, we cannot guarantee the security of your data transmitted to our site; any transmission is at your own risk. Once we have received your information, we use strict procedures and security features to try to prevent unauthorised access. If you have a password to access registered only parts of our website, you must not share it with anyone. You have the right to request a copy of other personal information that we hold about you.